When you plan your walling it is best to discuss it with the neighbours, so as to avoid annoying them so they go and report you. If you are doing it together then you can carefully plan what to use and how best to set it up. You do not want to obstruct your view, or your neighbours, as it is extra security to be able to see through to each other’s property in case help is needed. If you are using wall toppings, and decide on plants, you need to use something very thorny to prevent anyone accessing your property over the top. 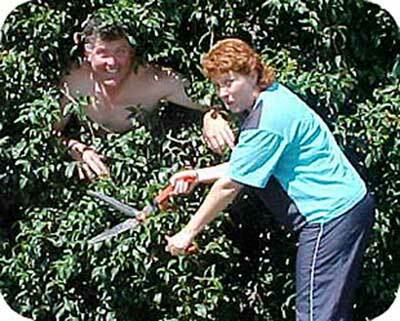 The only drawback is when you need to prune the plants. Always wear adequate protection, including goggles, to prevent injuries to yourselves. The last thing you want is a thorn in your eye. Plants can be added above fences in boxes, with trellis to climb over. That way, they won’t obstruct the view, but will make it extremely difficult for anyone to climb over without serious injury. Hedges are a deterrent, but they also offer protection to criminals who have found a way to get into your property, as they can then hide from neighbours or passers by. An English rambling rose is also a good plant to use, and has the benefit of beautiful, abundant fragrant roses. 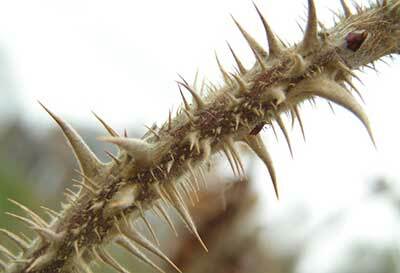 The rose thorns are vicious to say the least and very copious, making it impenetrable. Nothing is absolutely guaranteed to keep anyone off your property, especially if they come prepared. But the hassle they will have will give you ample time to summon help. Bottom line is, do everything in your power to keep your family and property safe, even if it does mean extra work to prune and train plants correctly. Why not contact us at Country Wide Walling to discuss your needs with our highly trained consultants. They will gladly advise, guide and assist you, or simply request a free quotation. If your boundary fence or wall is 1.8m in height, you are able to attach extra security extensions. The total height should not exceed 2m. 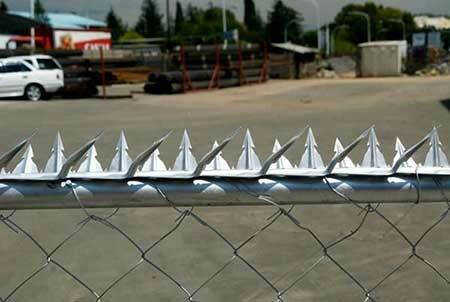 Three dimensional razor spikes are very popular as anti-climb protection, and also suitable to top gates. There is a Razor Spike designed which provides greater strength, and serves as both a physical and psychological barrier to any would be intruder. These spikes are manufactured from steel and are heavily ribbed during the manufacturing process. This ensures ultimate sharpness and strength. The spikes are 11cm high and consist of 2 (two) rows of spikes. The inner spike is a thinner and stiletto shaped ribbed spike which is capable of penetrating a foot or any body part coming into contact with it. The outer spike is barbed and angled outwards overhanging the edge of the structure to which it is attached. These spikes are virtually impossible to climb over, and are a huge security feature, and have the added advantage that they are maintenance free. 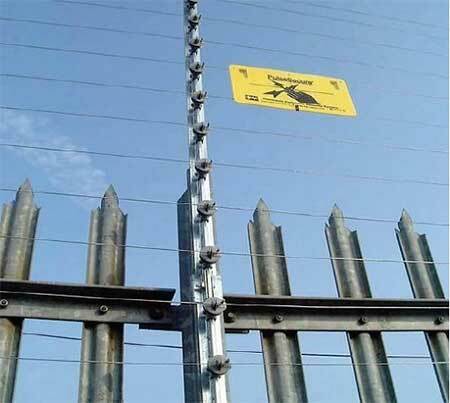 Spikes can be fitted under electric fences, to ensure the extra security and impenetrability we all seek, in order to keep our property and family safe. Spikes can also be installed under roofs to make it impossible for anyone to climb onto the roof to gain access to your home or business. 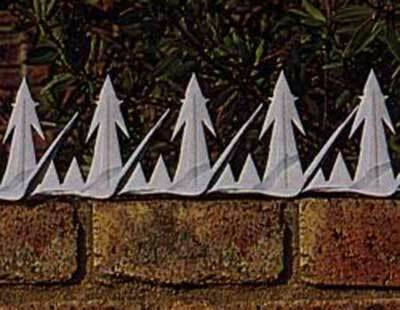 As spikes are considered extremely dangerous, they should only be added to walls or fences at a minimum height of 2m. At no time must they be added where there is a possibility of injuring pedestrians. 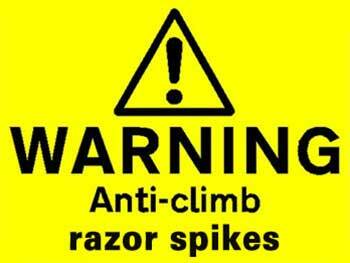 The spikes must be completely visible and must comply with local laws and regulations in regard to height and positioning. There should also be clear warning signs to prevent any bad repercussions at any time, should an unsuspecting person get seriously injured. To discuss all your options, and aid in assisting you to make the right choices, or to request a free quotation, please feel free to contact us at Country Wide Walling. 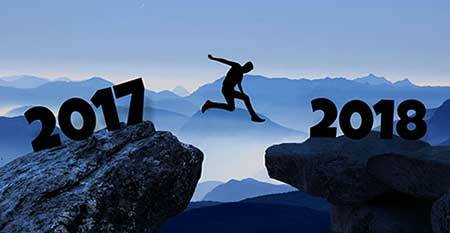 Our consultants will gladly assist you. With our harsh climate and high crime rate in South Africa, Concrete Palisade Fencing has become the material of choice, as it can not only withstand harsh weather and wear and tear, it also has the benefit of being see-through, meaning that nobody can sneak up to your property unseen. 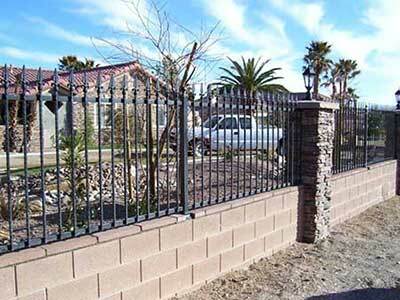 Another benefit is that Concrete Palisades have no scrap value, unlike metal, which can be stolen and sold as scrap. Concrete Palisade fencing marks the boundaries of your property in a neat and aesthetically pleasing way, at the same time screening your home and garden, thus providing security and maintaining your privacy. 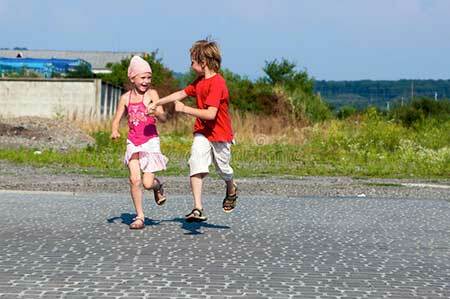 We all know that small children and pets love to wander, and we need to keep them safe, and prevent them from wandering out of your yard into the streets, and into danger from traffic. We would all love to have high, solid walls around our properties to ensure our privacy, but the drawback is that it also provides privacy to intruders, as, once they have found a way in, they cannot be seen from the outside by anyone passing by, or even security on patrol. Because our products use integral colour, your palisade fence will stay looking beautiful for years to come. Permanent colour can be added during the manufacturing process, which means your palisade will remain beautiful for many years. At Country Wide Walling we take pride in our workmanship, and endeavour to exceed our clients expectations. 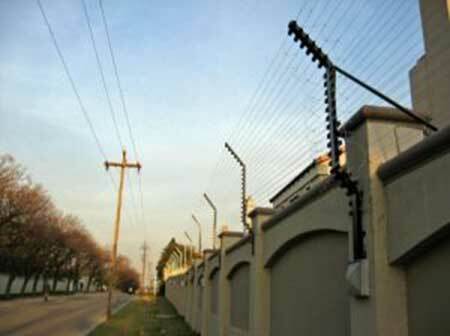 Electric Fences are used to increase the security of a boundary wall, and are an electrified barrier added to the top of a boundary wall or fence. Make sure you check the by-laws in your area before erecting an electric fence, or any wall or fence, as local authorities and municipalities have their their own by-laws that must be complied with. An electrified fence is an electrified barrier erected on top of a boundary wall or fence, and may not be a freestanding electric fence. No freestanding electric fences may be erected along any boundary, in such a position that it would allow people to accidentally come into contact with it. Electric fencing is erected to keep intruders out, so should not be erected in such a way that a passer-by could accidentally come into contact with it. • They must not be any higher than 450mm. • They must always be at least 1.8 m above ground. • They can only be erected on top of walls or fences. • They must never encroach over site boundaries. Other wall-top barriers, e.g. barbed wire, should never be electrified, as the purpose of electric fencing is that a person who touches the electric wiring, will let go immediately. Electric fences are an excellent deterrent to would-be intruders, but we can’t stress enough, they should never be a danger to anyone else. If you would like more information about boundary walls or fences, please do not hesitate to contact us, or to request a free quotation. Select a blog entry Your Decision to Make Wall Leaning How To Paint a Fence How to paint a plain precast wall Repairing Larger Holes and Cracks Are You Ready Layered Security All Round Security Strategic Planning All is not Lost Retaining Walls Please Fence Me In Start Thinking Like a Criminal. Don’t Attract Criminals Risk Assessment is a High Priority Your Home is Your Castle Watch Your Footing Do You Know The Difference? Sinking Concrete Raising with Trellis Raising Boundary Walls Dry Rot When to Replace Your Fence Remove Algae, Mould from Walls or Fencing Prevention is Better than Cure Commercial Property Security Precast Perimeter Fencing Steel Gate Safety Do I Need Walling? Sliding or Swing?